Model for the action of Cannabinoid-Receptor 2 signaling in HSC formation. CB/CNR2 signaling promotes PGE2 synthesis in the Aorta-Gonad-Mesonephros (AGM) region during hematopoietic niche formation (18-24hpf) via the up-regulation of COX-2, increasing Hematopoietic Stem Cell (HSC) production. 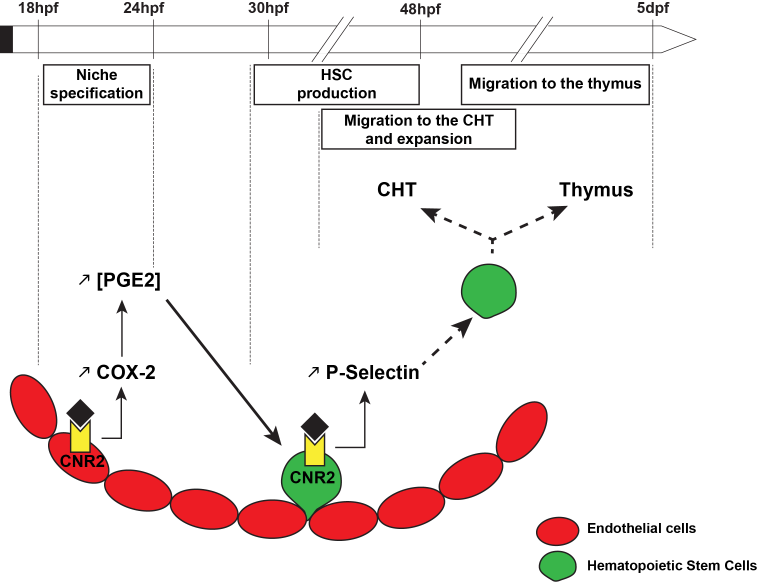 Newly formed HSCs express CNR2; upon CB ligand binding, P-selectin expression is up-regulated promoting HSC movement from the AGM to the Caudal Hematopoietic Tissue (CHT, 30-38hpf) and the thymus (30-120hpf).